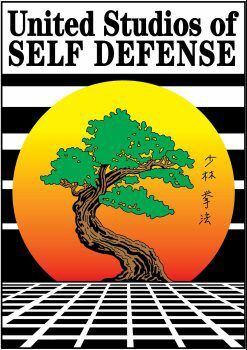 At United Studios of Self Defense, every student receives thirty minutes of private instruction each week. Private Instruction provides the ultimate in personal training. This focused learning approach insures that each student will get the attention they need to succeed. Students may be teamed up in the private to begin training on the more advanced principles and applications of techniques. Private Instruction is always scheduled at your convenience. In addition, students may attend as many group lessons as they like. Groups increase stamina and provide an excellent time to practice skills and techniques with students close to the same age and ability. All techniques and material is contained in our Student Manual. The student will also see the material performed by Masters on their Training DVD's. The average student will advance properly attending between two and four times per week, including the private session. Each class is tailored to the needs of the student, which allows progress at a much faster rate. Students can receive additional help in troubled areas.